Our choice for a Fitness App of the Week is an awesome iOS platform that makes self-defense training unified and simplified. It’s called JabMix and it’s here to help you find the right MMA trained partner to help meet your self-defense training needs. 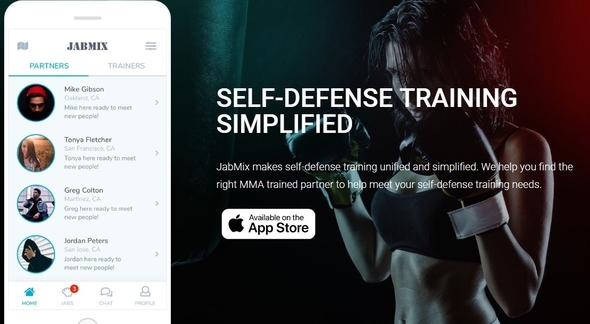 Developed for IOS users, the JabMix is an efficient and helpful fitness app for self-defense training, allowing users to easily setup their profile and look for their right MMA trained partner based on their location. With the help of this app, users are offered to find MMA trained partner nearby, in their area of living, setup and schedule training sessions as it suits them. The app is highly efficient, easy to use with user-friendly interface, allowing users to fulfill all their self-defense training needs. By using this fitness app for self-defence training, users are offered many helpful features that will allow them to easily find the perfect MMA trained partner and meet their self-defence training needs. On this app, users can use the chat to discuss with other users about their workout routines, their training needs, their availability for training or anything that they want to know. Users are also offered to schedule training sessions with users that live close by them, choosing the time, the date and the location for the training. The app has also to offer the option for profile review, allowing users to set their photos, location, and their MMA interests like Kick-boxing, Boxing, Karate, basic self-defence, Jiu Jitsu, Muay-Thai or Karate. Just by using their location, users are able to schedule meetings with partners in their area of living, whenever they want to and wherever it suits them. With the app users will easily and efficiently find the right MMA partner, meet all their training needs, choosing the dates and the locations by preference, without any effort. Download the app now on App Store for free and easily meet your self-defense training needs!